GoodData has gone the extra mile to provide pre-built integration with cloud based data integration tools. GoodData launches the industry's first Business Intelligence Platform as a Service (BI PaaS), opening GoodData's cloud business intelligence platform to any data, any model, any source. 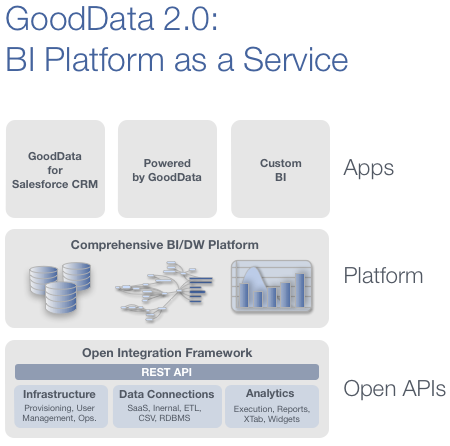 Effective immediately, GoodData's cloud BI platform is available as a set of REST-based APIs and connectors, published on GoodData's Developer Network and supported under an early access program. According to Gartner Group, 40% of BI budgets will be held by business units by 2012. GoodData is meeting this shift in BI adoption through GoodData on Demand and GoodData for Salesforce CRM, SaaS applications that make it easy for companies to deploy operational dashboards in a fraction of the time and cost of other approaches. With today's announcement, GoodData extends these benefits beyond initial usage by making it easy to incorporate more data from more sources. "Openness and flexibility are central to the founding vision of GoodData," said Roman Stanek, GoodData Founder and CEO. "GoodData delivers self-service dashboarding and analytics for business users; now with our BI PaaS, we can deliver self-service for technical enablers as well." Fluid Data Model: GoodData's new fluid data modeling framework makes it simple to adapt the underlying data model that powers every GoodData project. Now it's possible to add new data sources or modify existing data or connections without re-building reports or dashboards. Open APIs: GoodData now has published REST-based APIs for data modeling and loading, to complement existing APIs for project and account management and report execution. Pre-Built Connectors: GoodData has published pre-built connectors with Salesforce CRM, Google Analytics, flat files and relational databases, all available free of charge. Developer Community: The new GoodData Developer Network now includes full API documentation, tutorials, pre-built connector code and a command-line tool for developers to build custom data integrations, all hosted on GitHub. "Setting up operational reporting for our company in GoodData has been great. Their new data integration framework will increase the power of GoodData in our company by tenfold by making it easy for me to add more data and adjust our data model." -Andrew Bartels, IT Director at PSA Financial. "Business Intelligence is one of most requested uses of cloud integration from our customers. Packaging GoodData and SnapLogic together lets customers start analyzing any of their business data in minutes. Now dashboards and reporting is a breeze for any of the dozens of systems that are connected via the SnapStore." -Gaurav Dhillon, SnapLogic Chairman and CEO. Join GoodData for a live webinar on July 13 at 10am PDT for an in-depth tour of GoodData Platform as a Service, or register today to be a part of the early access program. GoodData is the first company to offer a complete business intelligence platform-as-a-service (BI PaaS), providing our customers and partners operational dashboards, advanced reporting and data warehousing at a fraction of the cost and complexity of other approaches. GoodData is headquartered in San Francisco and located in the cloud at http://www.gooddata.com.